Located within the walls of Jerusalem’s Old City, the Church of the Holy Sepulchre contains two of the holiest sites in Christianity: the spot where Jesus of Nazareth was crucified, and the tomb where his body was laid to rest after his death and before his resurrection. This week, thanks to a rare agreement between the Roman Catholic, Greek Orthodox and Armenian churches who share responsibility and control over the Holy Sepulchre, a team of experts began much-needed renovations at the site. The church, a destination for Christian pilgrims since its creation in the fourth century A.D., was last renovated more than 200 years ago, after a fire nearly destroyed the ornate chamber housing Jesus’ tomb. In 325 A.D., Emperor Constantine the Great, considered the first Christian emperor of Rome, built a basilica on what was believed to be the site of Jesus’ crucifixion (known as Calvary in Latin and Golgotha in Greek) and his burial. 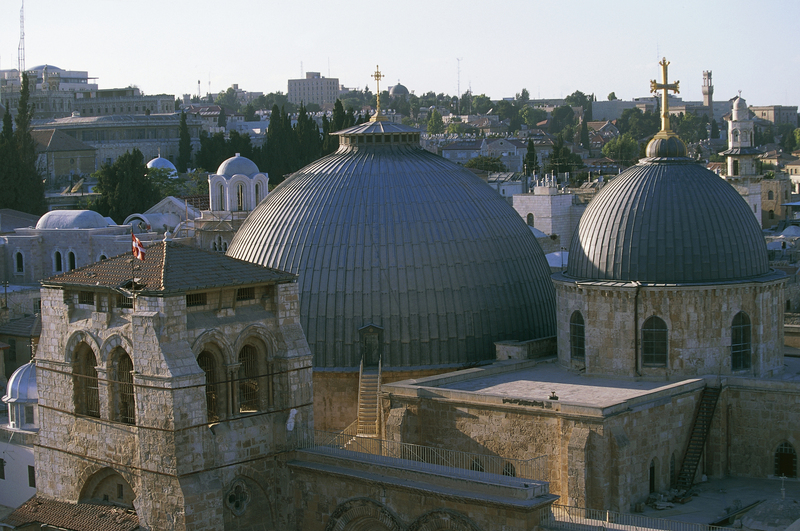 After the Muslim Caliph Al-Hakim had the original structure destroyed in 1009, the Crusaders restored it in the 12th century, building the Church of the Holy Sepulchre we see today. In 1808, a fire in the church all but destroyed the Edicule, the impressive structure looming above the spot where, according to Christian tradition, Jesus’ body was anointed, wrapped in cloth and laid to rest before his resurrection. The repairs completed after that 19th-century blaze marked the last time the Holy Sepulchre underwent any kind of restoration or renovation–until now. Earlier this week, a team of nine Greek experts began working on the church, focusing on repairs, fortification and preservation of the Edicule, in particular. The start of the renovations marks the culmination of a long struggle between the Roman Catholic, Greek Orthodox and Armenian churches, the three powerful denominations that share responsibility for the Holy Sepulchre. Each denomination has control over its own section of the church, and each guards its domain closely according to a strict power-sharing arrangement established back in 1852 by the Ottoman authorities then governing Jerusalem. 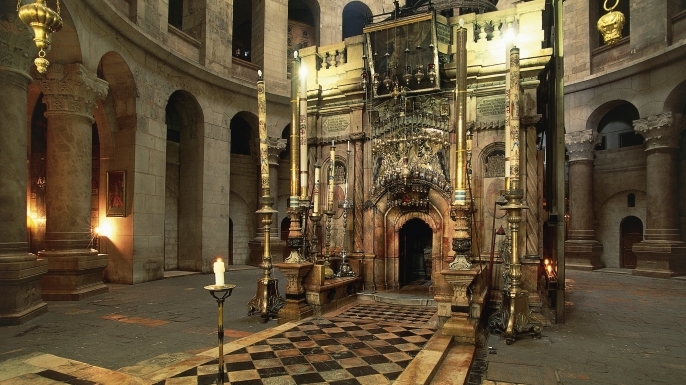 The experts working on the Holy Sepulchre have previously performed similar renovations on the Acropolis and various Byzantine churches throughout the Mediterranean. Their painstaking work includes repairing the mortar between the church’s marble slabs, some of which have been deformed due to centuries of exposure to water, humidity, smoke from candle use and other environmental stresses. Another task involves removing the heavy buildup of wax and carbon dioxide on the surfaces using cotton swabs dipped in soapy water. Though British authorities built an iron cage around the Edicule in 1947, it has not been enough to adequately protect the structure, which the experts plan to fortify against the risk of earthquake damage. In all, the restoration work is expected to cost some 3 million euros, or $3.3 million. All three churches will contribute funds, and Jordan’s King Abdullah has also made a personal donation to help with the restoration. Jordan controlled Jerusalem’s Old City until the Mideast conflict of 1967, and continues to aid in the preservation of Muslim and Christian holy sites there. The work will continue over the course of some eight to 12 months, and some of it will be conducted in the early mornings or late at night, to allow for minimal disruption to both the workers and visitors to the site. Thousands of pilgrims and tourists visit the Holy Sepulchre each year, a sign of its enduring importance among Christians of different denominations around the world.